No theme park has generated more urban legends—and more confusion about the line between myth and actual, horrible reality—than Action Park, the late, lamented (and since semi-resurrected) water park in northern New Jersey. And no ride has been the subject of more rumors than the Cannonball Loop. 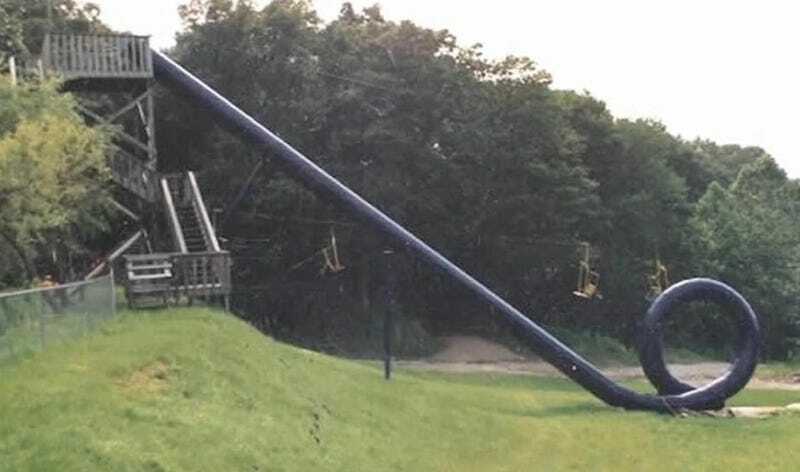 Shoddily run, with the barest nods to safety from both the park's staff and visitors, Action Park was responsible for a staggering amount of injuries and several confirmed deaths, and if you grew up in the area in the '80s or '90s, it was the most fun place on earth. But upon entering, you were confronted with the looming hulk of Cannonball Loop, a water slide that put riders through a complete vertical loop. It was never open. You wondered if it had ever been open. According to the most commonly cited reports (Action Park history traffics in folk memories, not hard facts), it was open, for all of one month in the Summer of 1985, before mounting injuries saw it shut down by the New Jersey Carnival Amusement Ride Safety Advisory Board. (It also appears to have been open for brief periods before that.) There has not been, to my knowledge, any actual video of the slide in action. Until now. The video above, a compilation of commercials and early home movies of Action Park, was recently uploaded to Youtube. It claims to be the first footage of Cannonball Loop in action. I don't know if that's true, but at the 8:17 mark, you'll see a couple of riders enter the slide, and somewhat miraculously, come out at the bottom. The video was sent to me this morning by Adam Ringler, who was the former director of operations at Action Park. I had interviewed him for our documentary, and he thought it would be of interest to me. He told me that he was cleaning his garage and found the VHS tape amongst the junk. He proceeded to toss it on YouTube (hence the piecemeal compilation feel of the video). It sort of a "best of" Action Park video that a former park executive had made using primitive home video equipment. I remember one person getting stuck in the tube because instread of riding down with her feet crossed and arms folded across her chest she put them out and braked then didn't have the speed to get around. That is why they built the hatch at the bottom of the slope. A few people did similar things or for some other reason did not get sufficient speed and they landed face first on the inside of the top of the loop. One person injured his two upper front teeth when he did this and had them dig into the soft lining (it was like wrestling mat material). The biggest problem is that sand and dirt and such would collect at the bottom of the loop and the people would start coming out with abrasions over their entire backs. Then they would have to close it down and clean it out. I was one of the idiots that accepted you-know-who's crisp $100 bill to test run it. That was my last ride. $100 did not buy enough booze to drown out that memory. God bless you, Action Park. You will forever have my heart, and however many collective pounds of my skin were shredded off on the Alpine Slide.